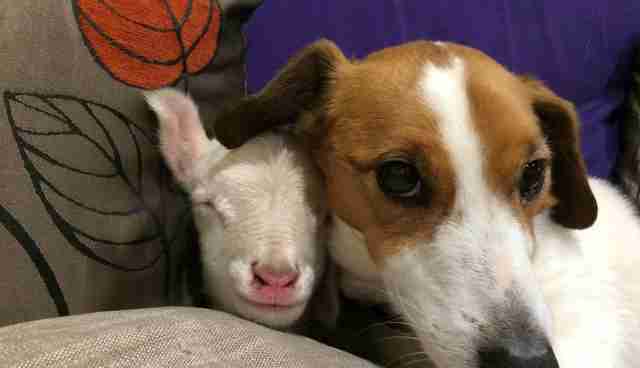 "I didn't know who was going to be cuddled up to him when I walked into the room!" 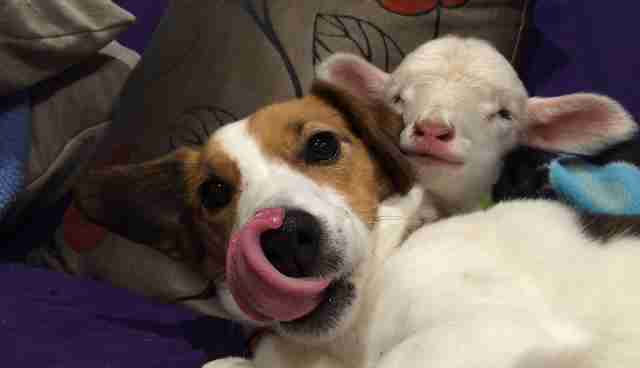 She thought the lamb was going to die. 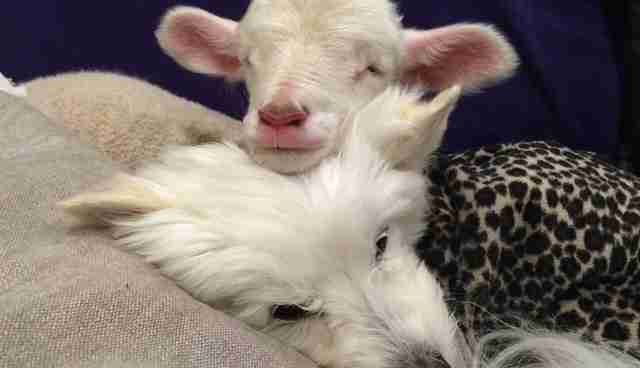 When she picked him up, the lamb's body was cold and limp, and he was too weak to hold up his own head. 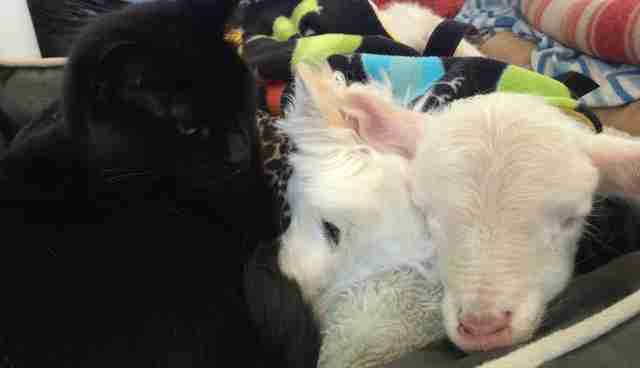 He'd lost most of his color, and at one point, she couldn't even see the lamb breathing. Eagles had started circling in the sky, waiting for their chance to swoop. 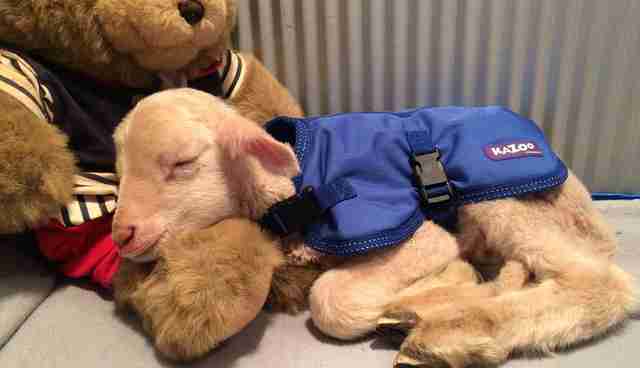 According to the farmer who found the lamb, the mother had abandoned him at birth. The lamb was just 2 days old. 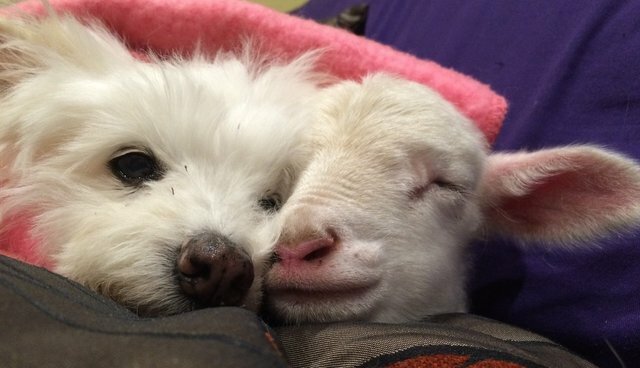 The situation seemed hopeless, but Kathy Munslow still rushed the lamb to Gunyah Animal Healing Sanctuary, a rescue and rehabilitation center she runs in Victoria, Australia. "I've raised quite a number of orphaned and critically ill animals over the years and know the most critical thing is to gradually increase their core body temperature, then to try and get them to take some fluids," Munslow told The Dodo. 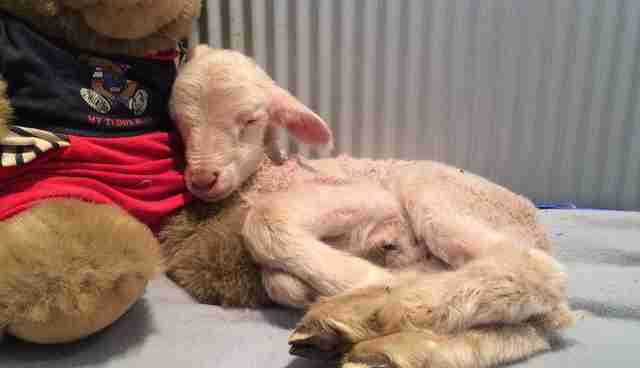 After about an hour, the little lamb - whom Munslow named Kenny - started coming back to life. His body temperature rose and his skin regained its color. Then, after about two hours, Kenny was bright and alert and up on his feet. He even started taking milk from a bottle. This was incredible as young lambs have a difficult time surviving without their mothers; they also rely on the mother's colostrum milk in the first 48 hours of their lives to build up their antibodies and strengthen their immune systems. Since Kenny was abandoned at birth, he probably didn't get his mother's colostrum milk, which jeopardized his chances of surviving. "I was quite amazed with his progress,' Munslow said. "When I first saw him, I would've given him a 20 percent chance of surviving the first 48 hours, possibly less." Munslow was keeping Kenny inside her house while he was still in a critical condition. 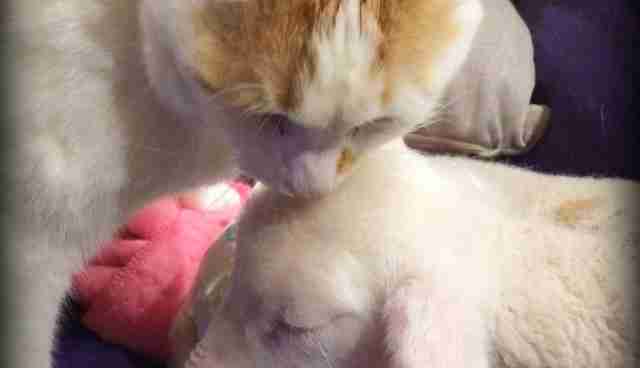 When she left the room for a moment, she came back to find something that melted her heart. "I walked into the lounge room and found Kenny and my dog Jemelda lying together on a dog bed on the floor," Munslow said. According to Munslow, Jemelda - a 16-year-old rescue - often snuggles up to new residents at the sanctuary, so it wasn't a big surprise to see Jemelda lying next to Kenny. 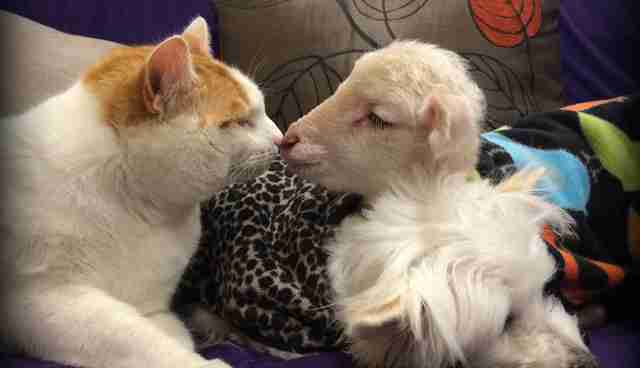 But Munslow was surprised when some of the other animals cuddled up with Kenny too. "So far there's been Jemelda, Mel (our Jack Russell mix), and William the cat," Munslow said. "I also saw our other cat Mishka sitting next to him, and she normally doesn't go near anyone! They're fairly used to new animals coming into the house and have been known to snuggle up to them before, but it's happened a lot quicker with Kenny and has been pretty much nonstop." "It got to the point where I didn't know who was going to be cuddled up to him when I walked into the room!" Munslow said. Who can blame them? Kenny is especially cute and cuddly. Kenny doesn't seem to mind the company, too. "I think he's really loving the connection, warmth and companionship," said Munslow. "He's a fairly quiet lamb. Sometimes other rescue lambs are more interested in running around and trying to eat everything in sight. I definitely think the close connections help with the healing process. It's one of the special things about this sanctuary that you really can't put a price on." 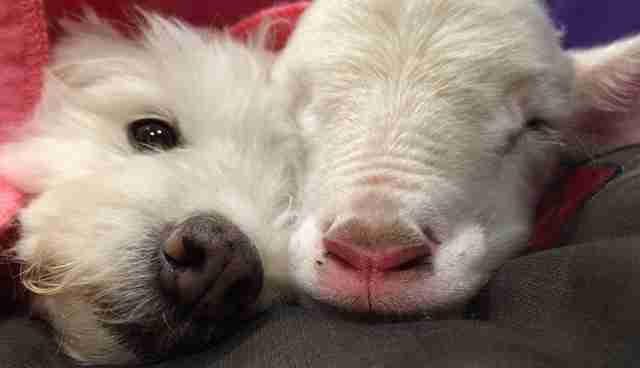 Besides cuddling with his new friends, Kenny loves following Munslow everywhere she goes, and looking at the other "strange lamb" in the mirror. He also likes burying himself under the pillows on the couch until just his tail, legs and bottom are sticking out. "He may not have his mum by his side, but he has no shortage of new friends here who have been doing a great job of making him feel safe and loved," Munslow said. "He's gotten over the really critical first 72 hours, and he's eagerly awaiting his bottles ... so everything is heading in the right direction at the moment." Gunyah Animal Healing Sanctuary is a 130- acre safe haven in Victoria, Australia, that's home to five pigs, 16 goats, three horses, five ponies, four alpacas, 16 cows, four lambs, two ducks, three dogs, three cats, over 40 sheep and an abundance of wildlife. The sanctuary relies on publication donations to survive, and you can support it by donating here.